Luke and I decided a few weeks ago that we need to use our weekends more wisely. We usually end up going into London, wandering around, pub hopping, eating dinner, pub hopping some more, and then going home. As much as we enjoy that, we are over 30 years old (one of us is still just 30 years old, hehe, for a few more days, grrrr) and we live in England. We need to explore England as it should be given just as much time as London. So I sat down and came up with a super long list of towns in and around England and a few in Wales that are worth a visit. First up - Cambridge! Even though Luke is now a licensed driver in the UK, we still chose to take the train. It was about the same amount of time, and according to online research, the parking situation in Cambridge is not the easiest. Plus, the train is so much more fun and relaxing! The train station is not far from the city centre, and signs made it super easy for us to find our way without using our smart phones. Cambridge is a beautiful city! The architecture is stunning - right up there with Amsterdam. In the summer time, oh my oh my, it would be even more incredible with blooming flowers and green vines covering several building walls! 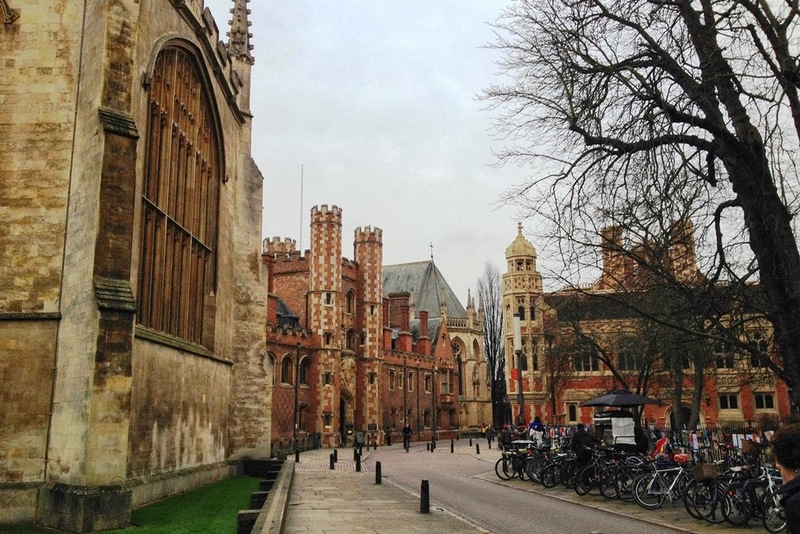 The University of Cambridge is the main attraction, so the city is full of youngsters. Can you imagine going to a school like this? Notable alumni include Sir Isaac Newton, Charles Darwin, and several others that would take me all day to list. The town is extremely bike friendly with proper bike lanes, but not all cyclists follow the road rules. Typical. We saw several warning signs regarding the penalties for bike theft and chaining them to certain areas, though. We weaved our way in and out of the narrow streets, trying to imagine what college life would be like in Cambridge. We covered most of the city in just under two hours. The wind was starting to kick in, so we needed an indoor break. We decided to have some lunch at a Turkish restaurant which was really good! Then we made one last loop of the town looking for the perfect pub. We decided on The Eagle, and it was literally the perfect spot! The Eagle is a historical site in Cambridge for two reasons, 1.) In 1953, it is the location where "The Secret of Life" (the structure of DNA) was discovered. 2.) The ceiling of the main bar is covered in graffiti of squadron numbers written with lighters by airmen during The Second World War. The ceiling looked kinda dingy if you don't know the history, but it is the real deal! The walls of the pub are covered in air force themed pictures and stickers - Luke really got a kick out of one of them! Luke and I both agreed that Cambridge is exactly what we pictured Oxford to be like. I guess it better that we chose to visit Oxford first or else it would have been a let down! Our day trip was a big success... minus rain and wind, but we can't let that stop us from exploring. Now we just need to choose our next English destination... any suggestions for the next best thing? Side Note: Look at how absolutely beautiful Kings Cross Railway Station is at night!! Amazing! One of the most famous rock'n'roll bands, Pink Floyd, formed in Cambridge (prior to their university years).